Snug in the womb of her mother in April 2009, Chloé couldn’t know that a change in Canadian law was about to make her stateless. 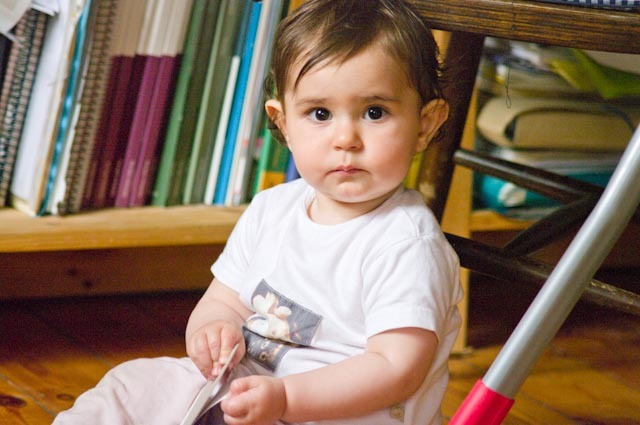 Chloé was born in July 2009 in Belgium, to an Algerian mother and a Canadian father. She is denied Canadian citizenship because her father was born outside Canada to a Canadian father. Nor is Chloé eligible for citizenship under Algerian or Belgian law, leaving her stateless. Without a citizenship, she cannot travel outside Belgium. The idea seems to be that Canadians shouldn’t be able to pass Canadian citizenship down from generation to generation without having a strong connection to Canada. But Chloé’s father, Ian Goldring, has a very close connection to Canada. He grew up in Canada from the age of three, going to school and university and working here. His mother still lives in Canada, as do his four sisters and various nephews and nieces. Perversely, if Chloé’s grandfather had not been a Canadian citizen, Chloé today would be Canadian. A father who immigrated to Canada with non-Canadian parents and then naturalized as a citizen would be able to pass on Canadian citizenship to a child born abroad. But because Chloé’s grandfather was already Canadian when her father was born, she is denied citizenship. How does this protect the value of citizenship? Canada is signatory to the UN Convention on the Reduction of Statelessness, which encourages States to grant citizenship at birth to children of citizens who would otherwise be stateless. Instead, Parliament approved amendments that go only as far as the absolute minimum requirements in the Convention. As a result, instead of reducing statelessness, Canada has been adding children like Chloé to the estimated 12 million stateless persons in the world according to the United Nations High Commissioner for Refugees (UNHCR). Next year, 2011, will be the 50th anniversary of the Convention on the Reduction of Statelessness. A good way to celebrate that anniversary would be for Parliament to amend the Citizenship Act so that Chloé and others like her are protected from statelessness. You can hear Mr Goldring discussing his family’s difficult situation on a recent edition of The Current (CBC radio).